24 Feb Filed under Fanmeetings, In Concert, Tribute Bands. No comments. 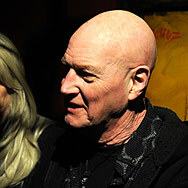 Chris Slade, drummer legend and former member of Asia, Uriah Heep, Manfred Man's Earth band and AC/DC, joined the annual party of the DYNAMITE Fan Club Germany as surprise guest!